This winter was a little lighter, despite the weather, thanks to LetterMo. Maybe you've heard of NaNoWriMo, National Novel Writing Month, when participants pledge to write a 50,000-word novel in a month, sharing ideas and support online. Month of Letters began a few years ago when author & blogger Mary Robinette Kowal extended a challenge: For the month of February, send one piece of personal mail every day that the U.S Postal Service is in operation. That's 23 pieces of mail, excluding four Sundays and one U.S. holiday. It's a little treat to find something in your mailbox besides unsolicited junk. Plus, the act of hand-writing even a short note is a very different process from composing an email or a text. For me, it's easier to visualize the person receiving the letter, to write as if I'm speaking to her, when I'm putting pen to paper, rather than pounding a keyboard. For my third LetterMo, I offered to include any Facebook friends who wanted to receive a letter from me. This felt a little heretical, using social media to reference a pre-Internet mode. But the results were pleasing. Our handwritten notes became another point of contact, a small way to know each other a little better. I mailed postcards, birthday cards, thank-you notes, just-thinking-of-you notes, and a fun flurry of Valentines. Some people wrote back just to say "Thank you for writing!" Try it yourself, one letter at a time. Imagine the face of your loved one or friend, when he sees your small gift. "Fast food" and "fresh salad" don't have to be mutually exclusive. I've enjoyed veggie-filled bowls at two local salad purveyers, Chop't Creative Salad and sweetgreen. Both shops offer fresh, creative combinations that make it easy to eat your colors. But if they were side by side, I'd head for sweetgreen. Here's why. There's some esthetics involved. The Bethesda branch of sweetgreen is a light, airy space, with all of the ingredients clearly presented below eye level, behind glass. Chop't is darker, and the diner has to peer over a tall stainless-steel counter to watch the salad assembly. At first, I thought the Chop't folks' exuberant use of the mezzaluna was a showy gimmick. Did I really want my meal to be minced? But the chopping does serve to mix the ingredients thoroughly, perhaps more than can be achieved by tossing. Caution: When the Chop't menu says "spicy," it's for real. (Another key word: "chili.") I like a little heat, but both of the dressings I've tried were potent, more heat than flavor. And I asked for light dressing. 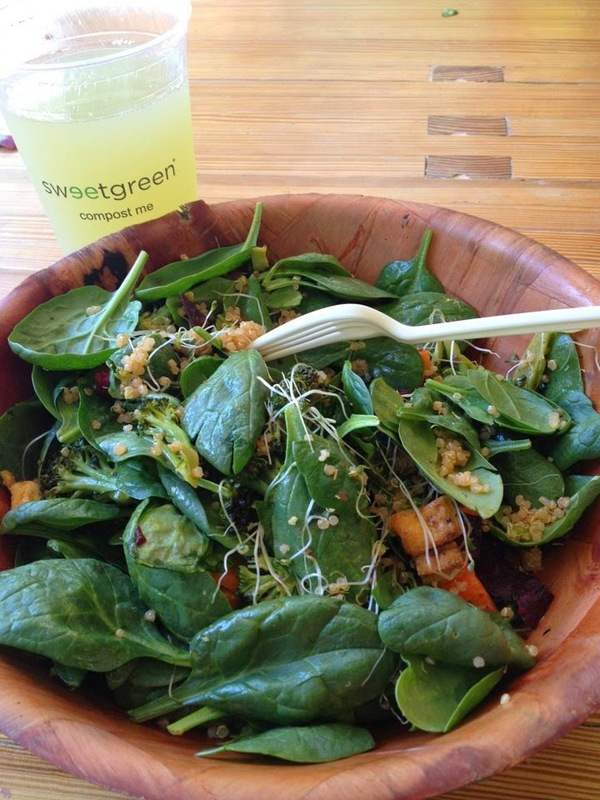 sweetgreen was founded in DC by three Georgetown students in 2007. I'm happy to support local businesses, and I like its use of local ingredients, always highlighted and sourced on a prominent chalkboard. 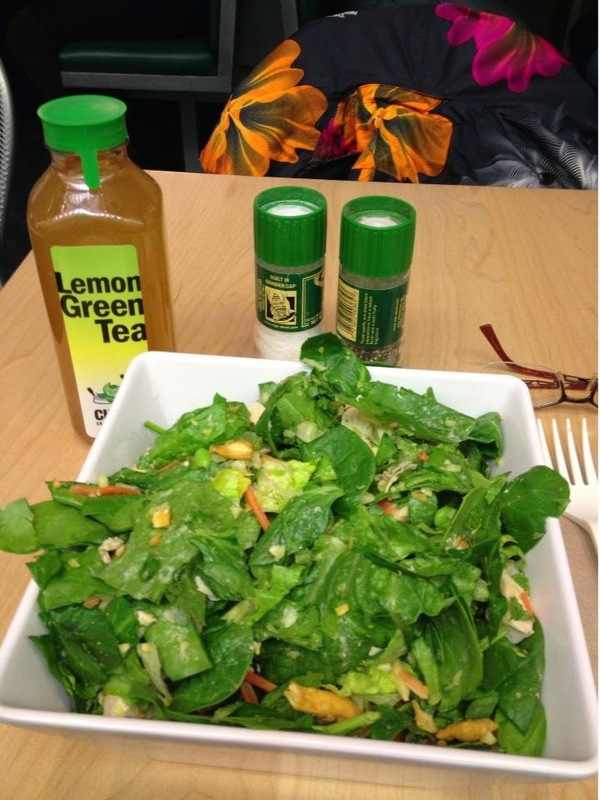 This is the only salad I have ever craved: sweetgreen's Spicy Sabzi. Organic baby spinach and shredded kale with spicy quinoa, spicy broccoli, carrots, raw beets, basil, sprouts and roasted tofu, boosted with a Sriracha-spiked carrot chili vinaigrette. Veggies don't have to be dutiful and dull! Mild sun on my face. Soondooboo (tofu soup) is a sensory experience that's just made for winter time. Especially for the end of winter, when it's been dismally gray for the longest time, and summer heat is like a dream you once had, barely recalled. I always burn my mouth, because it's scalding hot, and it stays hot longer than you think possible in that bubbling stone pot. I drop spoonfuls of sticky rice in the broth and try to skim soupy rice off the surface. I like breaking the fresh egg into the wonderful-smelling broth and swirling it around. Lest you think you'd never cross over, I'll warn you that I don't particularly care for tofu. Yet I get cravings for this soup. And it's not just because I like to play with my food. Part of the attraction is that this is slow food, Korean home cooking. Lighthouse is not the place for a quick lunch. The servers are speedy and attentive, and I suppose you could be in and out in under an hour if you ordered chicken teriyaki or bulgogi (both of which are quite satisfying, according to my tofu-shunning friend). But keep in mind that stirring, sipping, and warming up over this hot pot is a great way to linger with friends. Certain retail locations seem to have an aura of doom, with businesses cycling through, soon disappearing. I'm hoping this doesn't happen to Himalayan Heritage, an attractive new restaurant serving Nepalese and Indian cuisine in downtown Bethesda. This spot has been occupied by at least three restaurants in the last few years. Maybe the delicately spiced sauces and the "delights of Nepal" scattered through the menu will attract some attention and achieve permanence. As we looked at the menu, we were offered a complementary small plate of spicy edamame, served with puffed rice. Our friendly server warned us that the dumplings we ordered might take some extra time. But the food arrived promptly, perhaps because we were the only diners having a late lunch. I enjoyed the sunkoshi steamed momo, good-sized steamed dumplings filled with seasoned ground chicken. The aachar, a tomato-based sauce, carried some heat, but not at the expense of flavor. The generous portion was listed as an entree; I think it would be best as a shared appetizer. The lunch special was a bargain, combining tender lamb kadai (cooked with tomatoes, coriander and ginger) and a well-seasoned dal made with small black lentils. Plain naan was soft and buttery, good enough to eat by itself. Check in on Yelp and get a welcoming deal, or find coupons on the restaurant's own Web site. February always sneaks up on me, but I'm going to participate in the Month of Letters 2013, even though I'm off to a late start. Here's the challenge: Send one piece of postal mail per day, every day that the U.S. Mail is in service. That's 23 letters, notes, packages or postcards. And respond to every piece of personal mail you receive. Author, blogger, voice actor and puppeteer Mary Robinette Kowal isn't just trying to support the postal service. She initiated the challenge last year, to brighten up a dreary month and remind people about the special pleasure of getting something in the mail. More than 700 people participated in the 2012 challenge. "Email is all about the now. Letters are different, because whatever I write needs to be something that will be relevant a week later to the person to whom I am writing… It is relaxing. It is intimate. It is both lasting and ephemeral," Mary writes in her blog about the challenge. 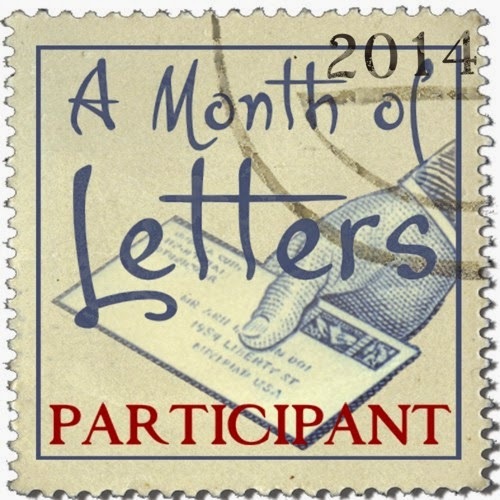 Follow the Month of Letters on Facebook (https://www.facebook.com/LetterMo) or Twitter (#LetterMo, or follow @LetterMonth). If you'd like some mail from me, let me know in the comments. (If I don't have your postal address, I'll message you.) Or just send me a postcard!